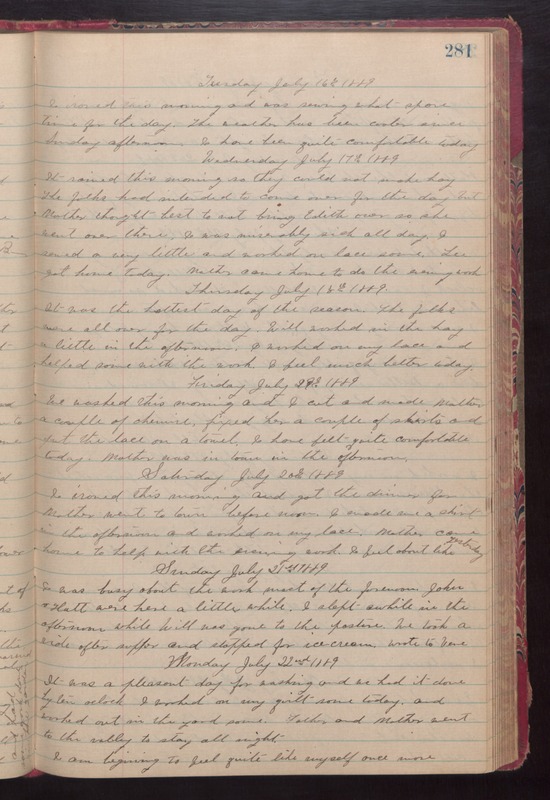 Tuesday July 16th 1889 I ironed this morning and was sewing what spare time for the day. The weather had been cooler since Sunday afternoon. I have been quite comfortable today. Wednesday July 17th 1889 It rained this mroning so they could not make hay. The folks had intended to come over for the day but Mother thought best to not bring Edith over so she went over there. I was miserably sick all day. I sewed a very little and worked on lace some. Lee got home today. Mother came home to do the sewing work. Thursday July 18th 1889 It was the hottest day of the season. The folks were all over for the day. Will worked in the hay a little in the afternoon. I worked on my lace and helped some with the work. I feel much better today. Friday July 19th 1889 We washed this morning and I cut and made Mother a couple of chemise, fixed her a couple of shirts and put the lace on a towel. I have felt quite comfortable today. Mother was in town in the afternoon. Saturday July 20th 1889 I ironed this morning and got the dinner for Mother went to town before noon. I made me a shirt in the afternoon and worked on my lace. Mother come home to help with the evening work. I feel about like yesterday. Sunday July 21st 1889 I was busy about the work most of the forenoon. John & Hatt were here a little while. I slept awhile in the afternoon while Will was gone to the pasture. We took a ride after supper and stopped for ice cream. Wrote to Vene. Monday July 22nd 1889 It was a pleasant day for washing and we had it done by ten oclock. I worked on my quilt some today and worked out in the yard some. Father and Mother went to the valley to stay all night. I am beginning to feel quite like myself once more.